MICAH 6:8 KJV "He hath shewed thee, O man, what [is] good; and what doth the LORD require of thee, but to do justly,..."
5O my people, remember now what Balak king of Moab consulted, and what Balaam the son of Beor answered him from Shittim unto Gilgal; that ye may know the righteousness of the LORD. 6Wherewith shall I come before the LORD, and bow myself before the high God? shall I come before him with burnt offerings, with calves of a year old? 7Will the LORD be pleased with thousands of rams, or with ten thousands of rivers of oil? shall I give my firstborn for my transgression, the fruit of my body for the sin of my soul? 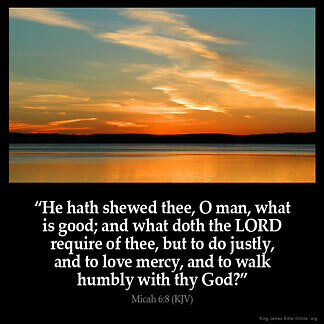 8He hath shewed thee, O man, what is good; and what doth the LORD require of thee, but to do justly, and to love mercy, and to walk humbly with thy God? 9The LORD'S voice crieth unto the city, and the man of wisdom shall see thy name: hear ye the rod, and who hath appointed it. 10Are there yet the treasures of wickedness in the house of the wicked, and the scant measure that is abominable? 11Shall I count them pure with the wicked balances, and with the bag of deceitful weights? Hee hath shewed thee, O man, what is good; and what doeth the Lord require of thee, but to do iustly, and to loue mercy, and to walke humbly with thy God? He hath shown thee, O man, what is good; and what the LORD doth require of thee, but to do justly, and to love mercy, and to walk humbly with thy God? 6:8 He - God hath already told you in his word, with what you ought to come before him. To do justly - To render to every one their due, superiors, equals, inferiors, to be equal to all, and oppress none, in body, goods or name; in all your dealings with men carry a chancery in your own beasts, and do according to equity. To love mercy - To be kind, merciful and compassionate to all, not using severity towards any. Walk humbly with thy God - Keep up a constant fellowship with God, by humble, holy faith. This passage is a requirement. Like steering on your car. you are not going anywhere without it !!!! God is just The judgment of God is goodness also severity we are to be imataters severity in a loving way as our Lord. Love to be merciful to also the forward and disobedient , Disobedience needs correction rebellion needs discipline. Walk humbly toward God to not be proud and arragont. Be doers of His word Not hearers only !!!! These are works that the child of God must actively participate in: be not hearers of the word only, but doers. God is calling for us to 1. do justly - make sure we are fair, not partial, nor be a respector of persons, but we treat everyone fairly and with love and respect; 2) love mercy..we have to have an intense desire to forgive people for things they may have done to us or show forbearance towards others - to show compassion; and finally, God wants us to walk humbly. We can't go around with our noses in the air thinking we're somehow better than other people. We should walk with meekness, modesty and with low degree..These are good works that God will write down in His book of remembrance. Father God, we give thanks unto your word, because your word is powerful, living and sharper. Your word works in our lives. We give Glory. Very encouraging and powerful message that can take somebody miles ahead.